what? A mere itty bitty little cartoon will accomplish what YEARS of concentrated efforts from the "current administration" FAILED to accomplish?!? And that is impending apocalyptic doom for all of us here - the brats and the brainiacs! The meek and the maniacs! You... and me too! Reality is sometimes much stranger than fiction is - indubitably. See? Muslims are better at their religion than Christians are! I have seen so many blasphemous doctored pictures depicting a likeness of my Saviour - Christ, the son of God... and what has anybody done about THAT outrage? Were there any kidnapping threats issued? No! Anybody got fired? I don't think so! If they won't go this far for their Lord, it is obvious that not one single soul in the Christian world would kill a blasphemer (always a fellow westerner too! Never a "foreigner" - another thing that Islam has over the Western world - their unity!). The fact that an apology was issued (by... someone, somewhere!) does not help matters at all, alas. For it is indeed as null and void, seeing as other papers have dared to reprint the cartoon... Thus, we can assume that Al Aqsa Martyrs Brigades remain on standby... Next stop: the Islamic Jihad. Yikes. Don't the Danish wish they had had one less cartoonist among their creative people now... hmm? "The government of Denmark has to do something to appease the Muslim world," said an official. Hmm... Danish pastries for everyone - will that do? It will cost a bundle on postal costs alone though... all those carepackages, you know... Maybe sentencing to death the culprit -the cartoonist- will be less costly... hmm? Pakistan, as ever in the thick of things, had their precious parliament pass a resolution officially condemning the cartoon as "blasphemous and derogatory". Just to annoy their arch-nemesis and neighbor, India did not. Meanwhile, in everyone's favorite muslim country, IRAQ, Iraqi Christians are fearful - rightfully so too. There were excessive (and much more passionate than when it involves anti-american sentiment) violent protests, culminating with the burning of the Danish flag (which is all red... with a white cross on it! Depending how you are holding it, there's symbolism there...) and so, "a new wave of attacks by Muslims, driven by anger" over this cartoon could happen... and keep happening... until all cartoonists are dead and buried? "La Libération" in France has published the offending cartoon - and so has the Belgian newspaper De Standaard. Both defend the "freedom of expression" to the last apparently... even over survival instincts and good old fashioned common sense! It is, it appears, a Battle of the Value Systems - respect for religion versus freedom of speech. Care to place your bets on which side will win... and what will be the effects of that - and the long-term consequences? to be found worthy ~ you have to be a warrior! Former child actor and rather troubled young man Eddie Furlong - of T2, Pet Sematary 2, 3 Blind Mice and American History X fame - was recently labeled as a "warrior"... simply for reviving his career after some years spent being too much of a raucous rebel without any kind of a cause. As great as it is to see someone who picks himself up, hits the brakes on the self-destruct road they were on, and gets back on the road to recovery... this is not exactly what being a true "warrior" is all about. The best guidance to be found on this matter ~~~ is the following! That is why he is a warrior of the light: He has endured all this, and not lost the hope to improve. -Paulo Coelho, "The Manual of the Warrior of Light"
Luminous Paulo ~ Luminous Luciano salutes thee! For thee art worthy too - indubitably! 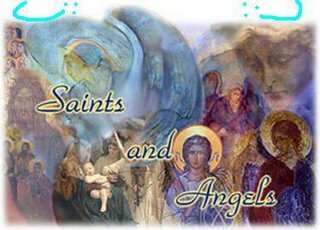 Saints & Angels: The TLB Prime series! "An authentic disciple of Christ experiences misunderstanding, and sometimes even persecution. These are consequences of adopting faith that strengthens with such trials. Why then are we afraid of inviting the Lord to all the matters of our life? Does the Gospel seem too demanding for us? Perhaps we just don't want to lose our previous goods, prefering everything to stay like it was? We, the Gerazeans of the XXI century, regret the pigs instead of enjoying the cure of our brother in faith. However, one must decide, whether he chooses pigs - our daily sins, or the curing power of the Christ." - f. Thomas Bielinsky. "St Thomas Aquinas (about 1225-1274) a Dominican, great philosopher and theologist, unrivalled lecturer is the author of "Suma Theologica" and many more works. His academic work enlightened people's ways to God. It's worth notice that his intellect hadn't overshadowed God for him but instead - helped to get to know Him. Let us ask then, by the intercession of St Thomas, that our mind enlightened us the truths of faith, which we declare." - f. Thomas Bielinsky. "The blessed Jerzy Matulewicz (1871-1927), the bishop of Wilno and the apostole visitor in Lithuania, rebuilder of the Gathering of Marian Priests, in his priestly life had experienced many adversities, slander and unjust judgements. He was burning with care for salvation of others, often saying that one must "bring Christ everywhere". How do we use an occasion to spread God's Word around us? Sharing the Gospel is a sign that the grain, which had fallen onto our hearts, is bearing a fruit." -f. Tomas Bielinski. "The helpmates of Jesus are not only those of the closed group of twelve. 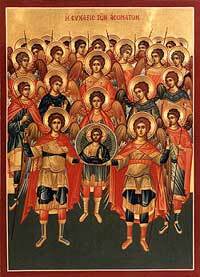 It's also the group of seventy-two scholars, assistants of the Apostoles, like Saint Bishops: Tymotheus and Titus, and also the group of all faithful. "Though the toll is great, there are only few workers." - isn't that because it's we who don't take up Jesus' calling? Because we don't feel worthy, because we don't believe that He wants to spread the Gospel through us? After all, the saints were men just like we are, they also needed an encouragement, advice, an embrace from the One, before whom we're standing." -Mira Majdan & Agnieszka Wedrychowska. No one worthier of accolades than these individuals, I say! Is that enough for a quota here...? This girl was murdered while on the job, in Québec, Canada recently. Her funeral took place yesterday morning - and was televised. The third program (the IVAC - the latter three letters standing for "victimes d'actes criminels") would have only given her family a little 3000$ had she been a homebody - and this primarily due to her age... meaning it could have been LESS! DISCRIMINATION regarding the way one's family DIED. The most outlandish scenario is what would have been better taken care of - what were the odds that she would have been run over by a car behind her cash register?!? This WAS a self-service gas station! She was being exploited in a lousy job with lousy hours (obviously hazardous time of day) and lousy pay... and for THAT she is awarded some sort of "basic" fund for her FUNERAL COSTS... I am sure her family is grateful for that! Another mother of a slain victim was seen this week - the media remembered the case of a girl who was beaten to death in Montreal in 2001 - and, in her case, the IVAC decided on the measly sum of 600 dollars as sufficient indemnifaction. That victim's mother kept the cheque but never cashed it in - she views it as an insult and will not accept that, according to some bureaucrats, her daughter's life is WORTH ONLY 600 BUCKS. How subjective the question of worth is - you see? This must be the topic of the week now, on TLB Prime! Topics have this way of imposing themselves upon you... like characters impose their "will" on writers sometimes... just ask King, Rice or Crichton about that sometime! The truth is, MILLIONS could not replace a departed loved one - especially when that loved one died a violent death that he or she had not deserved... met an ignominious end he or she had not had coming. And the fact is, those who do have it coming seldom get it. They had nothing better to do that night than to go rob some place... and they could not steal without killing? 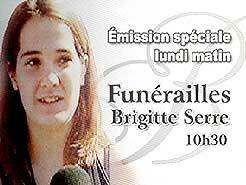 Brigitte Serre was only 17 years-old... SEVENTEEN YEARS-OLD! She was worthier of the luxury of being alive than many among us... A GREAT MANY OF US... she didn't hurt anyone, she didn't belittle anyone - heck, she was in sales, wasn't she? She HAD to like everyone. Nor worthy of a good service. I recently stated that Bill Cosby summarized it succinctly well when he said "I don't know the key to success, but the key to failure is trying to please everybody." Nowadays though, "everybody" is a critic. The infantile and immature ones will always want to ascertain their alleged superiority (a word that I loathe) upon either those that they despise (I have been despised - I will be again - for speaking the truth!) or those that they simply... envy (I have been envied too - since the day of MY BIRTH... again a fine subject for another blog post, methinks). 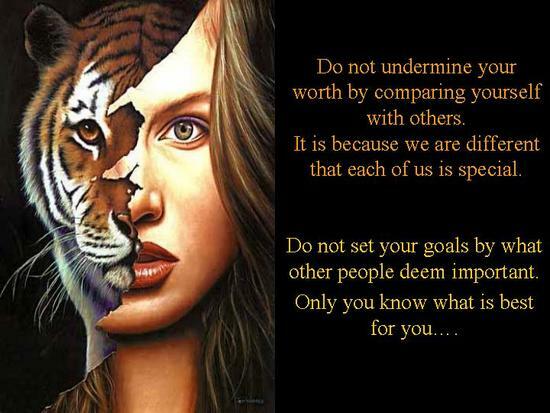 My point is -and I sure do have one- none of this "worth" talk makes any sort of sense! As pointed out in yesterday's post, we are all unique and different - there is no point in going any further into that! Haven't you folks heard that "it ain't fair to compare" yet?!? What is the worth of each one of these individuals? Were they not all created equal...? Are not earthly accomplishments ephemeral at best in the Grand Scheme of Things? Will anyone of us take with himself - or herself - his/her riches, prizes, decorations, kudos, accolades, awards... any of "da goods"? The answer is simple, my friends (and the rest...) - NO. Whether you are a believer and whether you're not - those facts remain the same. Nothing of "the present" will remain - NOTHING. The unbelievers will see this as ample reason to do as they please in the here and now - and trample all over others in the process. Their self-gratification knows no boundaries - for they have it that they will not be held accountable for anything at all... ever! None of their diplomas will be remembered once they are no more - why should their sins be remembered - right? Again, another simple answer - however, this time, it is WRONG, not right at all. Ever thought in terms of ABSOLUTES? I repeat - have you ever thought in terms of ABSOLUTES? GOD is the Absolute Righteousness. Absolute Righteousness Exists as well. The closer we inch towards it (we can never hope to be all that close at all, of course) the better we feel about ourselves (even those with little or no conscience cannot deny that fact - for even they have experienced contentment after "doing the right thing") and the more at peace we are with the world (even when confronted with injustice, stupidity, rudeness and their many, many kins...). In other words, the more serene we are. And, whether you are a believer or not, you want your peace of mind - YOU WANT YOUR SERENITY! YOU KNOW YOU DO! A SENSELESS WAR IS BEING FOUGHT IN IRAQ... just so that Americans can feel serene that the "terror threat" is being dealt with... so, carry on with consumerism, folks! This, evidently, has no ties to either a period of peace or wartime. In either situation, crudeness exists - and wants to overrule. The disciples of crude also like pre-conceit, foulness and filthiness. Ironically, these are the ones who will attack the worth of others - for they erroneously believe that their acceptance of any sort of outrageous and foul behaviour -in whatever medium that it is to be found in- makes them "better" somehow... They also see, of course, much more potential in themselves as "progressive minds" and even human beings... or they desperately want to see that in themselves, because they are afraid that the righteous and tasteful might be right about them (as we sure are) and that their days are therefore... numbered! Poor senseless souls - thou hast no idea what awaits thee! However... thou shall see - and soon at that! Me, in all this? I shall continue to aim to please only ONE - GOD! 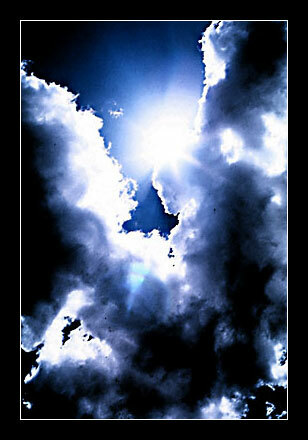 As I state on this blog and on my profile, I am reflecting His Light. My role-model in this exercise is none other than John The Baptist - and I choose him as such knowing full well what happened to him. He was not popular one bit. He displeased a lot of people - telling them, to their faces, what displeases the most... THE TRUTH. Luckily for me, I see no crooked, rotten-to-the-core king that could get me beheaded amongst my quarries... Only crooked, rotten-to-the-core jokers with a very warped sense of what is right, tasteful and "worthy". Oh - and of what is "funny" too. But it is another subject... or story... for another time! As Cosby said, trying to please everybody leads nowhere fast. We wind up straying from the right path OURSELVES in doing so... That is NOT for me! For I value MY SOUL too much for let that happen! Different strokes (I know Cosby wasn't in that one - ok?) for different folks - I am so very certain that these feeble minds I have been refering to have many other aspects of themselves that they value and emphasize upon... in stead of their souls. For all intents and purposes, they could be soulless! But they are not, not really. They just act that way - as if they were without either soul or conscience. Or good taste. Or a sense of what is right and wrong. Or decency. Or plain good old common sense! They lack in many essential, key departments of what makes "humanity"... human! Humanity was created in the image of God - lest you forget! We are to aspire to be closer to Him - not further and further from the ideal to the point that we indulge the bases instincts on a constant basis. When that happens, we are closer to animals than human beings at all. Those are the individuals that I have met, to a "T"... or maybe they just act that way. For the sake of their souls and loved ones (...) - I hope it is all an act indeed. For every one of them that is "just an outrageous act" though - there is one genuinely rotten to the core. Believe me on that - I know. What would be "the worth" of such individuals? High-pay (sounds more like high risk to me...) ultra-chic job worthy? Maybe my purposefully sardonic tone -no to mention the previous essay- is not indicating it to you yet... but none of these matter ultimately. What has to be worthy is YOUR SOUL. It's Officially The Year Of The Dog - Here's Something For All The Underdogs Out There...!